Recently my wife Elaine and I had a short holiday in the far south of England. Being on holiday should be our opportunity to get away from our normal day-to-day lives, i.e. Karate. However, it is still an opportunity for us to look at other martial arts in a different part of the country. We made some enquiries and found that on this particular night there was a session at the local sports centre. So at the appointed time we paid the centre a visit. We arrived as the session was about to commence in the main hall. We bowed as we entered the area and asked for permission to watch which was granted. We sat ourselves down happy to just observe the session. It was at this point that the main Instructor came over to speak to us.. He introduced himself and a colleague who was also an Instructor. John: “Hi I’m John and this is my wife Elaine”. 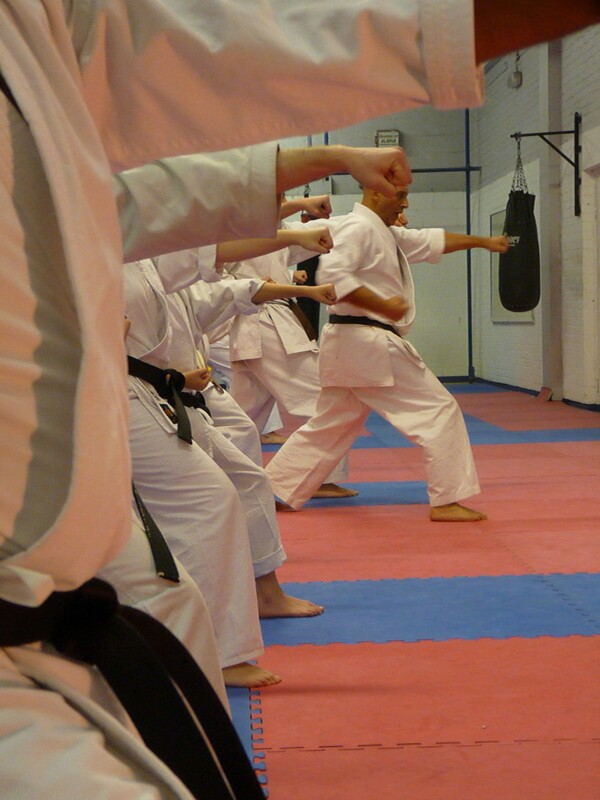 He replied: “So what was it you were expecting to see as this isn’t anything like Shotokan. John: “I wasn’t expecting anything in particular, I’m just happy to see something different. This conversation carried on whilst his students engaged in some drills of their own. After a while he excused himself while he and his friend got themselves some hot drinks from their flasks. Drinking his coffee and still ignoring his students (all 4 of them). He came back to us and tried to explain his brand of martial arts whilst criticising and pulling apart other styles. I didn’t allow myself to get drawn into this type of talk and I think he could see that he wasn’t having an impression on me. I think he thought a change of tact was called for so he invited us onto the matt. I politely declined telling him that I only wish to observe and I’d also had a large meal and a couple of beers. His reply to that was “ oh not to worry as we are not doing a warm up or drilling up and down all night, we will just be doing some Chinese Hands” He became quite insistent, so finally I allowed myself to be persuaded and Elaine and I took to the matt. He still wasn’t paying his other students any attention whilst he and his friend proceeded to show us a drill. Then instructed us on how to perform it ourselves. We soon picked it up as it was very similar to exercises we have done many time before. At that point they both left the matt another coffee break. Yes the session was that relaxed. On their return to us I was asked what I thought of the drill. Well this to my way of thinking wasn’t the first mistake of the night. We had only been there 20 minutes and they had managed to chalk up several. 2) Don’t slag off other martial arts especially to someone you know nothing about. 3) Don’t take a tea/coffee break every 5 to 10 minutes. 4) Don’t ask for someone’s opinion if you can’t take the reply. I told them that I understood the drill but found no value in it. I don’t like flow drills and never would. The other Instructor then asked me if he could show me how it could be used. We partnered off and went through the drill. I was being very compliant so every now and then he would push me away. This was his way of showing me how useful the drill could be I actually thought that it was a totally redundant exercise. Mistake number 5) he asked me again what I thought of it. Mistake number 6) we went into the drill, he tried to speed up and I reacted. I spun him round and into a strangle hold, as I did so I took his legs away. This guy had been telling me how much experience he’d had with other martial arts and had spent some time in the army. I naturally assumed that he wouldn’t mind being a little bit robust. However he told me I was being too strong and could I take it a bit easy. I honestly thought that I was taking it easy and I told him so. He didn’t seem to keen to carry on, so after a short conversation he broke off again for another coffee break. I looked across at Elaine and I could tell that she was pissed off. She left the matt and sat down. That left the other” Instructor” free to try to sell me some of his “Snake Oil”. This one apparently likes to demonstrate his version of dynamic arsholism on his students. So after he shows me how well he can hurt a compliant opponent I conclude that it is time to leave. I thanked them (for allowing us to watch) we just left them to carry on with their session. Elaine couldn’t get out of there fast enough. She just rushed off without a backward glance and I could tell she was very upset and in part 2 of this blog Elaine will tell her story herself. I hadn’t given them any information on my background or rank and to be honest I didn’t wish to and neither did they ask me. Apart from at one point the assistant Instructor asked me how long I had been training to which my reply was 40 odd years. Now to anyone with a modicum of common sense this should have imported some sort of message/warning but no, he just carried on regardless. So to conclude this story from my perspective, all I will say is, I believe that before you stick your head above the parapet you should always have a sneaky peek or better still use a periscope. If you really wish to see the bigger picture you don’t need new glasses, you just want to get things in focus. There will be a concluding part from myself (Elaine Johnston) very soon. The integrity of your students is paramount. always treat them with respect, regard,honesty and humility and in return they will allow you the authority you need to teach them well.